The Augusta Fire Department provided a fire safety training course to representatives from 20 local apartment complexes Thursday, August 7, 2014. Fire Lt. Carlton Bradley implored apartment complex managers and owners to take the lessons imparted over the two hour course and apply them to their communities. “The biggest thing I want you all to take away from this is to be safe and make your tenants safe,” urged Lt. Bradley. Thousands of people are hurt and affected by devastating apartment fires each year and many of these fires are preventable. Fire safety is an ongoing commitment for apartment owners and managers. They must ensure residents have access to smoke detectors, fire extinguishers, emergency exits, water sprinklers, and alarms. But, these tools are useless without frequent inspections and fire safety drills. 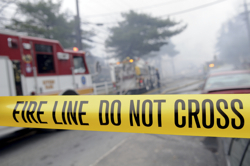 The Murray Law Firm protects victims and families harmed by apartment, nursing home and hotel fires. We hope other Georgia apartment owners and managers will follow suit and coordinate with their local fire departments to implement the best fire safety equipment, frequent safety inspections, and proper staff and resident education on fire emergency procedures. Through this preparation, many lives may be spared. Anyone seeking further information or legal representation is encouraged to contact us at 888.842.1616. Consultations are free and confidential.